Free from sugar. Food Supplement Advanced Vitamin C, B6, B12, Zinc and Selenium - Immune Support* Redoxon® Advanced is a high strength formula that contains all vitamins and minerals to help maintain your immune system - your body's natural protector - on top form. *Vitamins (C, A, D, B6, B12 & Folic Acid) & Minerals (Zinc, Iron, Copper & Selenium) help your immune system function - your body's natural protector. Vitamin A, Vitamin C & Zinc help maintain your skin - the body's first line of defence. Vitamin C, Folic Acid, Iron, Vitamin B12 and B6 each help to reduce tiredness and fatigue. 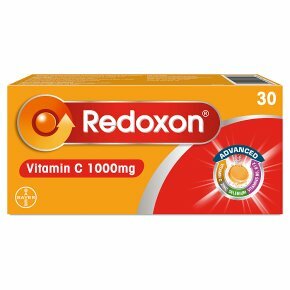 How to use Redoxon® Advanced? Adults and children over 12 years old: Dissolve 1 tablet per day in a glass of water to make a refreshing orange flavour drink. Even though you may not feel it, your immune system works 24 hours per day and that is why you need to take care of it. Food supplements should not be used as a substitute for a varied diet or healthy lifestyle.<br>Taking more than the recommended daily intake may be harmful.<br>Excessive consumption may cause laxative effects.<br>This product contains iron which is harmful to young children if taken in excess.<br>Not recommended if you are pregnant or breast-feeding.<br>Not suitable for people with kidney problems.<br><br>Keep product and empty tube out of the sight and reach of children.